We’d love your help. Let us know what’s wrong with this preview of The Year I Didn't Eat by Samuel Pollen. Fourteen-year-old Max doesn't like to eat, and the o This heartfelt, captivating novel chronicles a year in the life of 14-year-old Max as he struggles with anorexia. To ask other readers questions about The Year I Didn't Eat, please sign up. Gentle without condescension, THE YEAR I DIDN’T EAT offers invaluable, honest representation of an often overlooked group, situated harmoniously alongside buckets of humor and warmth. A hugely important story. In terms of content notes, BMIs are never mentioned. Max’s I absolutely loved this important, beautiful little book. I grew up thinking that anorexia and bulimia were only diseases that women got. Nobody directly told me this, I believed this because any book I read or anything I saw in the gossip magazines talked about how these diseases were affecting women, not men. We rarely talk about the men that deal with this horrible disease and this impacted how I understood eating disorders. When I was older I learned that both men and women suffered from these diseases. But still, it boggles my mind that I could ha I grew up thinking that anorexia and bulimia were only diseases that women got. Nobody directly told me this, I believed this because any book I read or anything I saw in the gossip magazines talked about how these diseases were affecting women, not men. We rarely talk about the men that deal with this horrible disease and this impacted how I understood eating disorders. When I was older I learned that both men and women suffered from these diseases. But still, it boggles my mind that I could have been so influenced by the media, books, and movies to believe that men were unable to go through this. I am so happy that this book was written because it gives a voice to boys and men who have struggled with an eating disorder. We can't forget that this is something that everyone can experience. I applaud this author for writing this book and sharing some of his story as well. this book is destined to be an important middle grade novel. 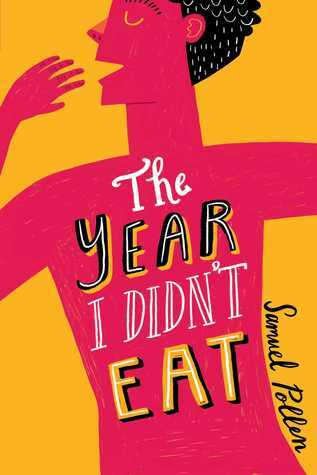 “THE YEAR I DIDN’T EAT” by SAMUEL POLLEN is a beautiful and honest portrayal of a teenage boy with anorexia. This was one of my most, if not my most, anticipated releases of 2019 because an own~voices novel featuring one of the most overlooked and ignored victims of eating disorders? Yes please! This book follows Max, an aspiring zoologist, lover of birds, brother of Robin and anorexia sufferer. Max was a protagonist I instantly connected with. He’s raw and relatable and so precious. I felt my h “THE YEAR I DIDN’T EAT” by SAMUEL POLLEN is a beautiful and honest portrayal of a teenage boy with anorexia. Max was a protagonist I instantly connected with. He’s raw and relatable and so precious. I felt my heart breaking the entire time as I read about his story and the things he was enduring. All of his struggles seemed so real to me and had my heart hurting. Max is an incredibly flawed character. He’s hot~headed and makes choices before considering consequences but that’s why he felt real to me. He didn’t feel like a character, he felt like somebody I’d known my whole life. I really adored the family dynamic. Max’s older brother, Robin, captured my heart immediately because of how caring and supportive he was. I loved him. His parents were interesting too because of how they handled and reacted to Max’s anorexia. I think Pollen could have been a bit more ambitious with making them have two distinct responses to portray how some parents handle it but nevertheless, it was fascinating to read about. Anorexia is the deadliest mental illness in the world with a fatality rate at 20%. Yet, nobody seems to talk about it. And when they do, society has created a harmful stereotype and a lot of stigma surrounding it. If I told you to imagine an anorexic, what would you picture? A girl. White. Pretty. A frail frame and laughing slightly as she refuses a cupcake. No. Anorexia isn’t pretty. Anorexia is organ-damage. Brittle hair and nails. Lanugo. Shivering uncontrollably in a warm room. Seizures. Fragile bones. Heart palpitations. A foggy mind and broken brain. Anorexia isn’t pretty even if that’s what the media makes it out to be. That’s why I loved this book. It exposed the true nature of the disease. It doesn’t glamourise it for one second, it shows how horrendous it is, how painful and scary and horrific the disease is. This is why the novel is so crucial and needs to be read by everyone. That being said, if you are vulnerable or suspect you’re not in the right head space to be reading something like this, I urge you not to. Although specific weights and BMIs are crossed out or left unmentioned, calories are. To an anorexic, food isn’t food. It’s numbers. This is evident throughout the novel as Max counts each crumb and thinks only of it as a digit. If this is something that would be damaging to you, please wait until you’re in the right mindset to read it. Another thing I really appreciated about the book was the positive portrayal of the NHS and therapy. As I’m sure it is for many, these resources are crucial to one’s recovery. This was expressed throughout the novel as Max attends counselling sessions which aid him to get better. I think this is significant as it can inform the reader that it’s nothing to be embarrassed by and it’s important in helping you get better. However, something about the prose didn’t mesh with me. I’ve never read anything by Pollen before so his writing style was completely new to me but I didn’t really click with it. To be honest, it was just bad. It was episodic and bland and really hindered my enjoyment. Obviously not the strongest aspect of the book. I found it very disengaging and resulted in me docking off a star from the overall rating. Another thing that contributed to the lower rating was I just didn’t care about Max’s friends. Personally, I didn’t like Evie. I still found her annoying and weird and just didn’t care about Max’s boyish crush. Ram and Stu didn’t really peak my interest either, they just blended together and I didn’t care what was happening with them. In conclusion, despite the quite boring writing style and few spelling and grammatical errors, this book was a pleasure to read. I loved learning about Max’s story and I think it’s destined to be an amazing and important middle~grade story. I loved it. As a woman in her fifties, I'm not the target market for this book. However, as a reader, and a person who appreciates fine writing, it's an absolute to pleasure to read this novel. Men's and boy's mental health has been discussed a lot this year, and ZunTold believe that it's important that we keep talking and keeping it high on the radar. The Year I Didn't Eat will be part of their 'Fiction As Therapy' arm, focussing on books with a therapeutic value. I think it's safe to say that most people, wh As a woman in her fifties, I'm not the target market for this book. However, as a reader, and a person who appreciates fine writing, it's an absolute to pleasure to read this novel. I think it's safe to say that most people, when thinking about anorexia, will associate it with teenage girls. We see images of young girls who are so poorly with this obnoxious disease on a regular basis. There are articles about places online where they can go to get 'advice' about not eating, and these articles always seem to mention females. However, as with all mental illnesses, anorexia is not gender specific and Samuel Pollen has written a frank and poignant novel about a fourteen-year-old boy called Max who is living with anorexia. It is absolutely clear that he draws from his own experiences, the insight into Max's thoughts and behaviours are incredible and I have no doubt that this must have been painful to write at times. However, it is also hugely important, and although it deals with the darkest of subjects, there is such humour within these pages too. I liked Max, I liked the way that he wrote to 'Ana'. I loved his family, especially his Brother, but not his Aunt and Uncle! This could have been stereotypical and cliched. Max could have been a shy, bullied boy, but he wasn't. Max was an ordinary kid, from an ordinary household who was gripped by an illness that was destroying him. I've never had anorexia, but disordered eating and twisty thinking are familiar ground. I'm glad the author warns about the content, because I knew to watch myself a little closer and to make sure I ate normally over the two days I was reading this. I can't remember the last time I tore through a book in two days! I did it because I *couldn't not. * I sank into Max's story like a warm bath. It is human, it is relatable, and it will stay with me for a long, long time. The characters are well-develo I've never had anorexia, but disordered eating and twisty thinking are familiar ground. I'm glad the author warns about the content, because I knew to watch myself a little closer and to make sure I ate normally over the two days I was reading this. I can't remember the last time I tore through a book in two days! I did it because I *couldn't not. * I sank into Max's story like a warm bath. It is human, it is relatable, and it will stay with me for a long, long time. The characters are well-developed and real-feeling; the narrative is simple and beautiful. "Someone doesn't need to understand you to save your life. They just need to care." A touching and authentic story about a teenage boy with anorexia. I grew to love Max, his loving and supportive family and all those in his network who rallied around him as he struggled with his eating disorder. So many kids will benefit from this beautiful story. A gripping, poignant, and very well written read - sometimes funny, sometimes downright terrifying, always warm, I really enjoyed this debut. A very important book - as someone who works with young people I've learnt a lot from this, and I think this is a novel that every school library in the country should have a copy of. While women do get eating disorders, and statistically more than men, their narratives are what almost entirely make up the "eating disorder fiction" world. Men, and young boys, can and do get eating disorders, and seeing this representation, especially for children, makes me hopeful. I was gifted an advanced reader copy of this book by ZunTold Publishing, though all my thoughts in this review are my own. TRIGGER WARNING: This book contains descriptions of disordered eating, anorexia and calorie numbers. This book was totally immersive and engaging from the beginning. I believed Max's story, and that is so important in a book like this. I haven't read anything about what it is like to have an eating disorder, and I neither have an eating disorder nor am I aware of anyone I know I was gifted an advanced reader copy of this book by ZunTold Publishing, though all my thoughts in this review are my own. Fourteen-year-old Max has been struggling with anorexia for a while. His family is doing all of the right things: he's in therapy, they don't make a big deal about food, and his brother Robin is especially supportive. Still, while he is generally holding things together, there are rough moments. When things don't go according to plan (like Christmas dinner with relatives), he gets very upset. Things are going fairly well at school, and he has good friends, as well as a new girl in whom he is interested. He is a runner, and the gym teacher understands that while he can't play contact sports, he doesn't have to sit on the bench. Max is, however, getting slowly worse, and when his brother moves out and his parents separate, his symptoms worsen and he becomes really ill. He starts writing to E., and this helps him more than his journaling had been. He assumes this person is his crush, but who ends up being one of his good friends. While Max continues to struggle, we end the book feeling that he will eventually learn to control his anorexia. Strengths: This is an #ownvoices narrative; the author suffered from this disease when young, so the details about the thought processes are very good. The parents and brother are particularly well drawn; their love and confusion about how to help Max are palpable, and the toll his problems take on the family are realistic. I'm glad that Max is shown in therapy, and there is some discussion of residential programs. Although the tone of this is light, there is no hiding of details about how bad not eating is for Max's body and health. Weaknesses: There are some British details about food and schooling that might make this confusing for some readers. There is also a lot of locker room discussion about asking others to exhibit body parts that was a bit alarming to someone unfamiliar with it. Max handles it in a clever way, but this makes me worry about British males. This fabulous, important novel works on several levels but more than any other, it’s a comforting and enlightening read for all who are directly or indirectly involved in the fight against anorexia. Without ducking anything, it provides a useful sprinkling of facts whilst sensitively examining related issues and emotions from every angle. In that sense it’s a vital source of information, support and insight for anybody struggling with an eating disorder, as well as their parents, friends, relati This fabulous, important novel works on several levels but more than any other, it’s a comforting and enlightening read for all who are directly or indirectly involved in the fight against anorexia. Without ducking anything, it provides a useful sprinkling of facts whilst sensitively examining related issues and emotions from every angle. In that sense it’s a vital source of information, support and insight for anybody struggling with an eating disorder, as well as their parents, friends, relatives, social workers and teachers. In the light of recent tragic Instagram news stories, it’s a timely and necessary book. However, it’s important to be clear that this isn’t just an “anorexia book” - it also works beautifully as a standalone novel for those free from that connection. Sam has a very easy, natural way with words, and the relationships and friendships he describes are real. He gives a genuine insight into main character Max’s inner voice: his deceit, his behaviour and his thoughts are all very well described. He reports teenage conversations with accuracy and authenticity and has the minutiae of adolescent life firmly pinned down. It’s a warm and uplifting novel, and although I suspect it to be aimed mainly at the young adult market, I’m 63 and it engaged me throughout! Max is a lovely, likeable character who I cared about and longed for a change in his situation. From the outset, I wanted him to win. However, it’s not all doom and gloom and there are plenty of intentional laugh out loud moments to stop the story becoming hectoring or heavy. Although I’ll never REALLY know what it’s like to be in Max’s position, I finished the novel with a much greater understanding as to what it’s like to live with anorexia, and for that, I’m grateful. PS: In the likely event of any Hollywood script writers reading this, I’d say there’s a major film here. There. That’s free - now get on with it. I was surprised to see a lot of myself in this book. I'm not male or anorexic. I used to be a female fitness competitor. I understand the constant counting of calories, protein, fat, and carb content. Obsession with food and the need to control one's food intake is a difficult habit to break. I don't think it ever goes away completely, no matter how "cured" you might think you are. Anyway, this isn't about me. Read the book. It's an easy read. The type is large and the lines are double-spaced. I was surprised to see a lot of myself in this book. I'm not male or anorexic. I used to be a female fitness competitor. I understand the constant counting of calories, protein, fat, and carb content. Obsession with food and the need to control one's food intake is a difficult habit to break. I don't think it ever goes away completely, no matter how "cured" you might think you are. I loved this book. The characters are so believable they leap off the page, meaning you really experience every joy and heartache that Max does. The whole novel is filled with so much warmth and written with great sensitivity. The way the author tackles the subject matter is both tactful and uncompromising, giving an extremely eye-opening insight into childhood anorexia. This is a very important book that will undoubtedly change children's lives for the better. I struggled to get through this, despite the topic being something I find particularly important. But an important topic alone cannot drive a narrative and I found myself halfway through the book wondering when anything was going to *happen*. Some parts were overexplained in a way that felt like a memoir and I wish the character of Evie was built out a lot more than it was. Overall, a book that sheds light on a significant issue, but didn’t quite hit home for me. A fantastic read about an important topic. Loved that it was a compelling story in its own right about a boy *with* anorexia rather than getting lost in the message or lesson. Loved the side characters too, especially Robin. You don't see many adult siblings in children's books. Also enjoyed that whole mystery with the note-writer and the exchanges with bonkers Evie. So interesting and never a boring part! I love how it shows how a person withe anorexia really feels and their thoughts. I loved the plot twist at the end( I won't spoil it for those who are thinking of reading this). I was kind of confused about Evie, though. However, I don't recommend this book for anyone younger than 12 because of swearing and some dirty stuff. I loved this sensitive, honest account of one fourteen-year-old boy's year battling anorexia. I learnt so much about this illness (also birds and geocaching - read it and you'll know what I mean). It's tender, funny and full of realistic family moments that feel so rare in contemporary YA. Funny, poignant and full of hope. A book anyone who’s been a teenager will relate to. I hope it finds the people who need it most. My heart goes out to Max!! This book REALLY captures his struggles in a way that made me understand what he was feeling. Definitely recommend. A rare but important look into the world of male eating disorders. It’s set in the UK. It’s about a teen boy. I can relate bc I’ve had this more of my life at this point than not. I don’t think everyone’s reasons are the same. It was an easy read story. Sweet and challenging. I really felt as though the teens were given authentic voices. On the younger side for Printz. An engaging and poignant story by an exciting new author of teen fiction. THE YEAR I DIDN'T EAT offers an honest and uncompromising insight into living with anorexia, written with humour and warmth. Fascinating read that allows reader to have a glimpse into the mind of a boy with anorexia. Cautious about sharing this book with impressionable students though.